If you want to design intuitive and engaging web sites, apps, print materials or products, then you need to know the psychology that underlies people's behaviour. 100 Things Every Designer Needs to Know About People explores both the foundational and the latest research in the psychology of the conscious mind and applies it to design. Susan Weinschenk has a Ph.D. in Psychology, and a 30-year career in applying psychology to the design of technology. She has written several books on user-centered design. Her 2008 book, Neuro Web Design: What makes them click?, published by New Riders, applies the research on neuroscience to the design of web sites. A popular speaker and presenter, her nickname is "The Brain Lady". She is Chief of User Experience Strategy, Americas, at Human Factors International, and runs a popular blog: Whatmakesthemclick.net. Pearson 9780132658607 9780132658607 100 Things Every Designer Needs to Know About People eBook If you want to design intuitive and engaging web sites, apps, print materials or products, then you need to know the psychology that underlies people's behaviour. 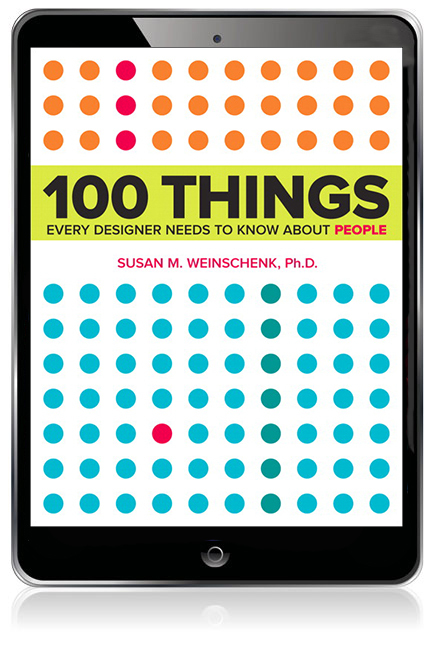 100 Things Every Designer Needs to Know About People explores both the foundational and the latest research in the psychology of the conscious mind and applies it to design.